This week, keep your eyes peeled for some of Montreal’s best Food Trucks, including Roux, Pas d’cochon dans mon salon, and Alexis le gourmand on both campuses. Food trucks will be stationed Monday through Friday, from 11 a.m. to 3 p.m., behind Redpath Museum at the downtown Campus, and on most weekdays in front of the Centennial Centre Building at Macdonald Campus. 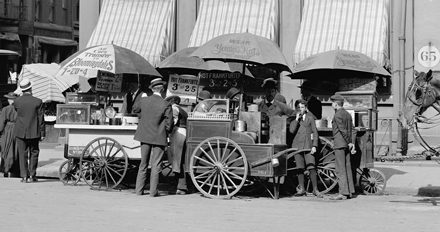 New York City street food vendors, circa 1906. This week, keep your eyes peeled for some of Montreal’s best Food Trucks, including Roux, Pas d’cochon dans mon salon, and Alexis le gourmand on both campuses. Food trucks will be stationed Monday through Friday, from 11 a.m. to 3 p.m., behind Redpath Museum at the downtown Campus, and on most weekdays in front of the Centennial Centre Building at Macdonald Campus. Be sure to “Like” our Facebook page for the schedule and check out our website for more information.